If you’re like me, you’re a gamer with at least one child, and you wouldn’t mind it if that child enjoyed playing an RPG at least once in a while. But realistically speaking, you’re not going to get far trying to teach D&D 5e to an eight-year-old. You need a game system that you can explain in five minutes to someone who’s never played an RPG. My favorite tool for that job is the wonderful Hero Kids Fantasy RPG, from Hero Forge Games. Hero Kids Fantasy RPG: The rule book, with hero cards, printable minis, and introductory adventure. Hero Kids Monster Compendium: 60 pages of fantasy monsters, with text, monster cards, and printable miniatures. Hero Kids Space Expansion Set I and Set II: Necessary additional rules for science-fiction adventure using the Hero Kids system, along with ten SF hero cards and printable miniatures per set. Hero Kids bundles: Hero Forge Games has published about 20 adventures and supplements for the Hero Kids system, many of which are available as discounted bundles from DriveThruRPG. The entire Hero Kids line qualifies for PnPG’s Christmas List of great gaming products discounted 25% during DriveThruRPG’s annual Christmas in July sale, but its a fantastic game any time of year! Hero Kids to the Rescue! The Hero Kids core book presents the system’s basic rules in less than twenty pages. The text is aimed at parent/gamemasters, but it’s written so that a bright third-grader can read it for herself. The rule system is dead simple, and can be explained to grade-school-aged children in five minutes. Characters are quantified by four dice pools (Melee/Strength; Ranged/Dex; Magic/Intelligence; and Armor). To attack, roll your Melee or Ranged dice (six-siders, of course); the defender rolls his Armor dice. If your highest single result beats or ties the defender’s highest, the attack hits, and the defender marks off a single hit. Three hits and you’re Knocked Out (no one dies in Hero Kids). For non-combat challenges, roll your relevant dice pool (Strength to lift a heavy portcullis, for example) against a difficulty number of 4, 5 or 6; you succeed if you roll the difficulty number or higher on one or more dice. Specialized skills, equipment, and environmental conditions simply add dice to the pools. 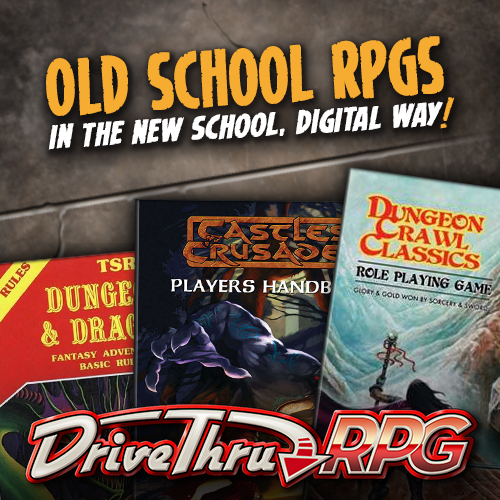 The rest of the rulebook includes advice for running adventures for children (yours or other people’s), Hero cards and printable minis for ten classic fantasy archetypes presented as pre-teen children, and Monster cards and minis for 16 basic fantasy RPG monsters. That may not seem like a lot of foes, but every published adventure introduces new monsters. And for gamemasters who want to write their own adventures, the Hero Kids Monster Compendium presents over 120 foes. Additional supplements add more PC archetypes and minis, as well as pets and special equipment. Hero Kids’ published adventures are intended to be completed in an hour or less. They are quick to read and ready to run. Each one offers guidelines to scale the challenges for parties from one to four PC heroes. All this means you can play on short notice. Give the text a quick read-through while your kids pick Hero cards, print the maps and minis for the adventure, and you’re ready to go. If your kids are more familiar with light sabers than broadswords, start them off with Hero Kid’s Space Adventures. Two supplements—Space Expansion Set I and Set II—each present ten new SF-themed Hero Cards and printable minis, while three published SF adventures take your heroes to galaxies long ago and far away. Space Adventures still uses the core Hero Kids rulebook. Conveniently, Space Adventures Set I and Set II both include the necessary page of SF-specific skills and abilities. We’re All Hero Kids Now!